You’ll love how easy this Slow Cooker Orange Chicken recipe is to make. Oh, it’s also insanely delicious too! My husband and I have been married for almost 20 years. TWENTY YEARS! It’s crazy to even think about how long we have been together. We met when I was 19yrs old. I’ve been married to him longer than I have lived without him! So many years, so many memories, and so many traditions! One of our favorite traditions has been to order Chinese food for our anniversary. It started when we were first married. We didn’t have much money to go out for fancy food, so we would order a Chinese dinner and have a bottle of wine together. Many times this was done after our little ones would be tucked into bed. We do still enjoy our take-out on our anniversary, but our kids have learned to love Chinese food as well! I try to limit how often we order out, so learning to make it at home has been quite a challenge for me. Not necessarily the making of the food, but the mind shift of how much easier it is to order our favorite take-out! So far, though, I have mastered the Chicken Fried Rice recipe and we seem to enjoy it as much as the take-out version! I’ve also made a classic Orange Chicken recipe, that takes a lot of work (if I’m being honest) but the flavor is SPOT ON to take out! And now, I’ve got a delicious Slow Cooker Orange Chicken recipe too. I made this recipe a tad easier too by cooking it in the slow cooker all day. 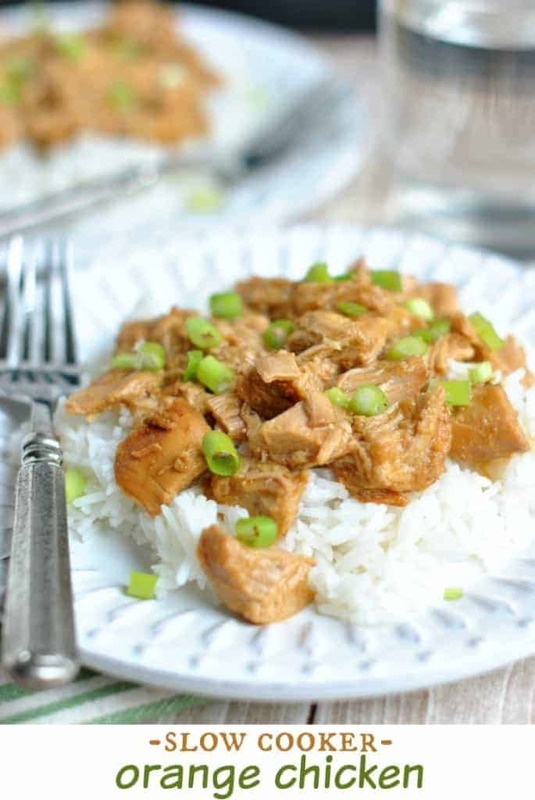 The chicken becomes so tender and flavorful, and perfect on a bed of rice. Do you have family traditions centered around food? I’d love to hear about them! A favorite restaurant? Or a favorite recipe? Now that the holidays are past us, is there a special tradition you have this time of year? 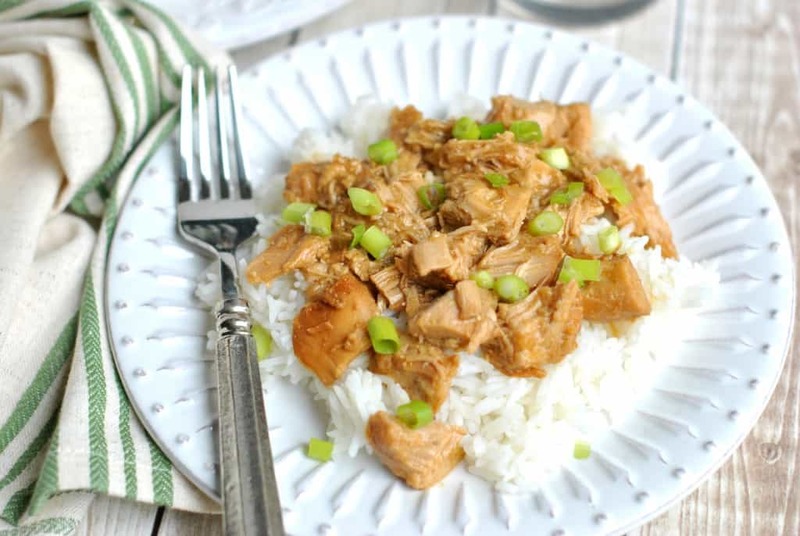 Be sure to head on over to Food Fanatic and print the Crockpot Orange Chicken recipe! This looks great! I’m coming on my ten year anniversary and it feels like it went by in a flash. congrats on 20 years! I LOVE that this is in the slow cooker. PERFECTION! And happy almost anniversary!! Aww, what a fun tradition! And this looks delicious! 20 years??!! Congratulations! Chinese take out is one of our favorites! I’m definitely making this next week-love that it is in the slow cooker! Pinned. We order chinese food for our first year anniversary! Unfortunately, we ordered bad chinese, so the rest of the night was spent laying around on the couch with stomach aches. Not romantic. Oh my gosh that is so awful 🙁 I hope that does NOT become a tradition!! I love how simple this dish is to make. I absolutely love orange chicken. Pinned. This looks so easy and delicious! 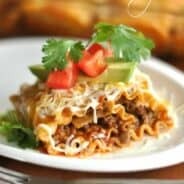 I’m always looking for delicious weeknight slow cooker meals…yum! 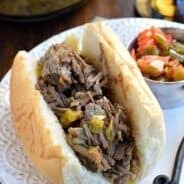 When I read “slow cooker”, I knew you made this recipe just for me! 😉 I don’t think I’d survive without that thing. Orange chicken is now on the menu! 20 years is a huge milestone. Congrats! Congratulations on 20 years! That is definitely something to celebrate! I love your tradition of ordering Chinese food and now I’m craving orange chicken. Happy Anniversary! Love how easy this orange chicken is to make! It looks incredible! Happy Anniversary!! 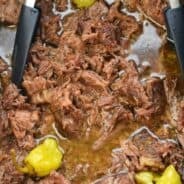 This dish looks fantastic! I adore oranges in savory dishes so this needs to happen soon! Aimee, that is awesome! 20 years!! I love that you guys still have the same tradition! My hubby and I have been married 13 years this coming march and we never do much for our anniversary either. We need to come up with something cute like this. 🙂 This orange chicken looks so yummy and easy to throw in the crock pot. I need to try this asap! Pinned! I cannot believe you have been married for 20 years. I thought you were still in your 20s for reals! Well this is a happening dish. I love that it can be made in the slow cooker. Must try! I love that you have this tradition that is so sweet! I’ve been with my husband longer then I’ve been without him too. We got together when I was 15 (31 now 🙂 ) Our tradition is Mongolian BBQ because it is where we had our first date. There isn’t a good one in Seattle so now we just do our best to recreate it at home. One of my favorite meals to make! Awww teenage sweethearts 🙂 I love Mongolian BBQ!! What a fun tradition to carry on every year!!! Happy Anniversary to you and your man!!! We do love Chinese food here too and I’m loving that this version can be made in the slow cooker!